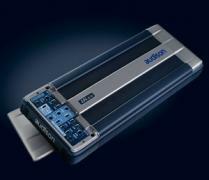 Audison LRx 6.9 wins another prestigious prize: the EISA Award 2006-2007 for the Mobile Amplifier category. After being given the 2006 Innovations Design and Engineering Awards at the CES in Las Vegas, this innovative amplifier fascinated the EISA jury too. Over 50 journalists of specialised magazines from over 18 different countries declared Audison LRx 6.9 the best amplifier of the year after studying the technology and design which makes it a unique device. The jury’s reasons in giving this prize were as follows: „Audison LRx 6.9 is the synthesis of new ideas in the field of dedicated car amplifiers. With six channels of the same power but different current capabilities, it introduces several novel concepts that really make the LRx a „next generation“ device. It features a changeable and reversible input module, to allow hidden or visible connections (Easy Common Interface); a fully-guided set-up process (Easy Set-up), enhanced modular concept (Modular SoundProof Construction), adaptive heat control system (Smart Air Flow) and an intelligent protection circuitry (Amplifier Management System). In total, the LRx 6.9 is a great step forward in the art of mobile amplification.“ Audison LRx 6.9 is a six-channel, Class AB amplifier, which stands out for its versatility thanks to an unlimited number of possible configurations. Like all of the LRx line amplifiers, it can reach the highest level in terms of power and performance. However, this product is the top of the line: sophisticated technology, original solutions and appealing design. Click here to download the Audison LRx 6.9 data sheet.